What an appropriate challenge for me to participate in because this is just what I have been doing with my art lately. I've been spreading my wings and soaring. I've been doing a lot of reading and studying up on Art Journals. The first thing I need to say as you gaze upon my first attempt. Almost all the artists I've viewed on YouTube and read books and articles about say there is no right or wrong. Take the techniques and make your journals your own personal journey and that's what I'm doing. I plan to title this journal Wonderful Words. I will be working on the cover at a later time and will be posting my progress as I go. You didn't know when you signed up to follow here that you would be going on such a wild trip. 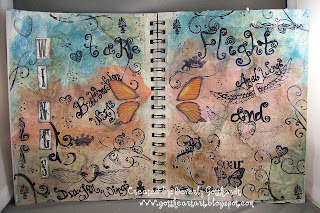 So, the journey began this afternoon with some Claudine Hellmuth products, Ranger distress inks, Mother Rubber Moon Shadow sprays, CTMH flourishes, Tim Holtz's big alpha stamp, and Hot Off the Press Flights of Fancy stamp set, oh and I can't forget the basic platform is a Canson 8 X 10 Mix Media book. Welcome to the Take a Word challenge! 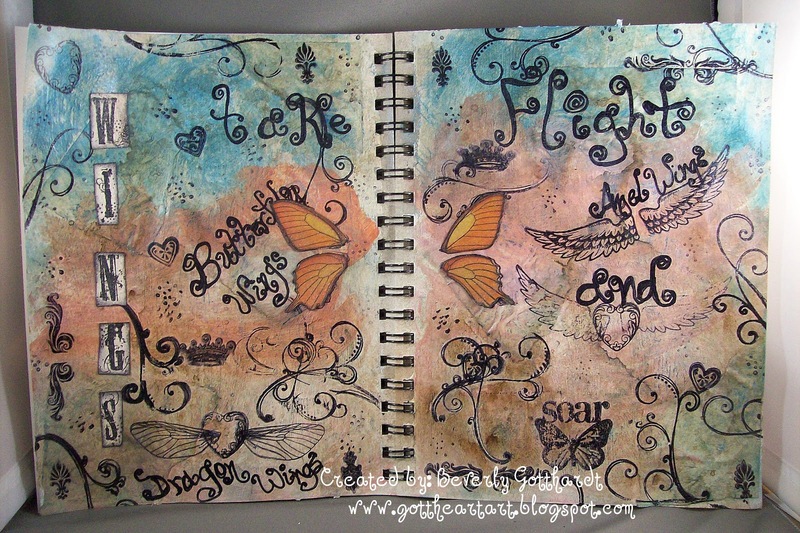 Your journal pages are softly beautiful. I can't believe you are a beginner. Thanks so much for taking part this week. Our new challenge starts tomorrow (Monday) and the theme is STARS. I hope you will have the time to drop in now and then.